BOSTON - Tuesday, April 2, 2019 - Building on Mayor Martin J. Walsh's long standing commitment to ensuring every child in Boston has access to a high-quality education, today Mayor Walsh announced the City will invest $15 million in his FY20 budget that will be released next week to establish the "Quality Pre-K Fund," which will guarantee equitable access to free, high-quality pre-kindergarten (pre-K) for all 4-year-olds living in Boston within five years. Mayor Walsh made the announcement alongside parents, teachers, students, working families, partner organizations, elected officials and education advocates at ABCD Walnut Grove Head Start, a community-based organization that offers high-quality preschool in Dorchester. The Quality Pre-K Fund will support the creation of 750 high-quality seats in the nationally recognized pre-K programs in Boston Public Schools (BPS) and in community-based organizations, such as ABCD Head Start, Boys & Girls Clubs, YMCA, and many others. When Mayor Walsh took office, the gap of high-quality pre-K classroom seats stood at 1,500, and over the last six years this number has been cut in half. 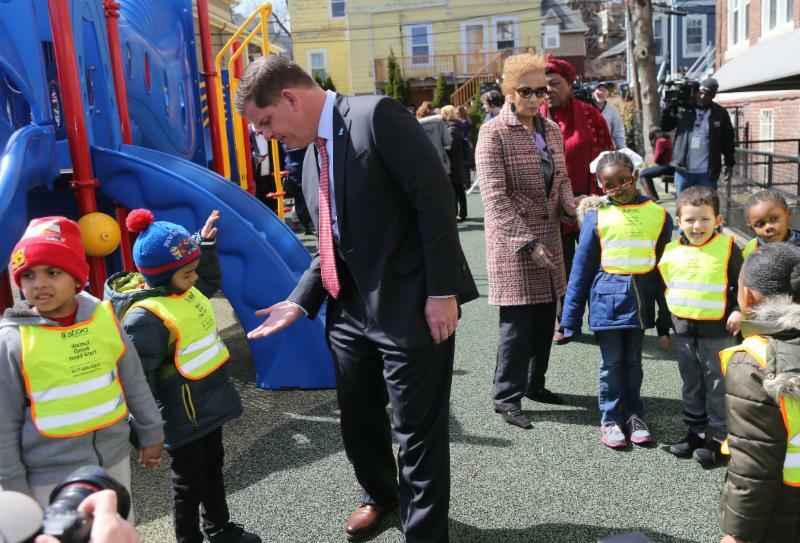 "There is no better investment we can make than providing our children with high-quality learning opportunities from an early age," said Mayor Walsh. "We have set a strong foundation over the last several years to offer more high-quality pre-K seats than ever before. I am incredibly proud that the Quality Pre-K Fund will fulfill our commitment of ensuring that every 4-year-old in Boston has access to high-quality pre-kindergarten in a setting that works best for their individual needs." "The Boston Public Schools early childhood educators are pioneering what pre-kindergarten can and should look like nationwide," said BPS Interim Superintendent Laura Perille. "Through the Quality Pre-K Fund, we are providing more access and flexibility for families of 4-year-olds that will help to close opportunity and achievement gaps, and set up our youngest learners for long-term educational success." All pre-K teachers have a degree in early childhood education, are prepared to teach in "inclusive" classroom settings to support students of all backgrounds, and earn the same starting salary for a Boston Public Schools teacher. Students learn from the Boston Public Schools Focus on K1 Curriculum and Building Blocks Curriculum, which are national models in early childhood education. All classroom environments are age-appropriate and culturally responsive. The classroom ratio is two educators for 20 students. The program is accredited by a national early childhood accrediting body, and meets other accountability benchmarks. "Mayor Walsh's UPK programs are a meaningful investment; benefiting the children served and the City of Boston overall," said Melissa Ryan, an early childhood educator at the Boys & Girls Club of Dorchester. "Studies show that high-quality UPK programs prepare children to enter school ready to succeed and positively influence the health, economic, and social outcomes of society. Boys & Girls Clubs of Dorchester applauds Mayor Walsh for his commitment to children, instilling hope and preparing the city's future generations for success." The City anticipates the current high-quality pre-K seat gap will be closed within five years through the Quality Pre-K Fund. The $15 million will ensure classrooms are staffed with highly-trained and well-compensated teachers, culturally responsive and inclusive learning environments, ongoing professional development for staff, and use of a proven curriculum that focuses on literacy, math, and supports for students with additional needs. "Our partnership with BPS through the Preschool Expansion Grant has been a wonderful collaboration," said Amy Turner, Executive VP of Child Development at the YMCA Boston, a community-based organization that offers pre-kindergarten. "Our teachers and administrators have grown their instructional practice. They have had increased access to professional coaching supports and development opportunities. Most importantly, our children and their parents have benefited from the learnings and leave our programs better prepared for kindergarten." The mixed delivery option of high-quality pre-K offers parents and families important flexibility to choose a setting that works best for their schedules and children's developmental needs. "My child attended Paige Academy which has in many ways encouraged me to get more involved in my child's learning," said Cristina Clark, parent of a student who attended Paige Academy and is now in BPS. "To know that the program was also supported by BPS and that Neveah was having an experience similar to her peers in BPS was a plus. As my daughter moved into kindergarten, I knew that both she and I were better prepared. It is exciting to know that so many families will be able to have the same quality experience that we had." BPS oversees a nationally recognized early childhood education program that is child-centric, uses play-based curricula, is highly developmental, and is shown through research to lead to academic gains for several years, helping close the opportunity and achievement gaps. Data shows that BPS has some of the strongest impacts of any national preschool program, as a result of its commitment to meeting the high-quality standard. In addition, BPS pre-K attendees outperform students in third and fifth grade MCAS, both in ELA and Math. "Over the last 15 years, Boston has been a national leader in using the best science in early childhood education to create high-quality preschool classrooms," said Christina Weiland, assistant professor of the University of Michigan's School of Education, who has authored numerous studies on BPS early childhood programming. "This new investment builds on that strong history and represents narrowing the opportunity gap for more of Boston's young children and families." The majority of BPS early childhood classrooms have earned accreditation from the National Association for the Education of Young Children, affirming that these programs offer high-quality, state-of-the-art education to help get children off to successful starts. High-quality early education has been a priority of Mayor Walsh since taking office, and he has invested new funds in pre-K every year since. In 2017, BPS hired its first-ever Universal Pre-K Director, TeeAra Dias, to play a vital role in building collaborations between schools, community programs, and city partners, working alongside Jason Sachs, BPS Executive Director of Early Childhood Education. In addition, a partnership between the universal pre-K initiative and UMass Boston has been developed to provide an instructional leadership course for community-based early childhood programs. The credit-bearing course aims to improve overall pre-K quality in Boston by working with the organization's teachers and program administrators to continue professional development on the BPS Focus on K1 curriculum. The first 25 participants completed the leadership course in June 2018. "High-quality pre-school education is one of the best investments society can make, as it addresses major problems like school failure, crime, and income inequality," said W. Steven Barnett, senior co-director of the National Institute of Early Education Research. "Nationally, few children from low- and middle-income families have access to high-quality pre-K. Boston sets the bar for other cities across the country, and this expansion shows a strong commitment to increasing access to education for students of all backgrounds." "The BPS early childhood program is already providing high-quality environments to preschool children, and this funding extends that quality to a much larger number of children, with a positive payoff for schools, teachers, and the children themselves," said Catherine Snow, professor at the Harvard School of Education. "United Way applauds Mayor Walsh for his commitment to ensuring children across the city have a high quality early education," said Michael Durkin, President of United Way. "In partnership with the City of Boston and Boston Public Schools, we have been working to identify where resources are needed most to accomplish this goal. United Way recognizes the important role that community based organizations play in this innovative mixed delivery model, and we will continue to invest in and support efforts to strengthen the quality of their impact." In 2014, Mayor Walsh established the Universal Pre-K Advisory Committee, which was tasked with building on Boston's nation-leading UPK efforts and recommending a citywide strategic framework and action plan to increase enrollment of 4-year-olds in high quality, full-day pre-K programs. The 30-member committee, composed of parents, representatives from early education and care programs, and public officials, as well as leaders from BPS and the Boston School Committee, philanthropy, business, higher education, and nonprofit and children's advocacy organizations, played an important role in representing a broad range of stakeholders. The Advisory Committeereleased a report in 2016 with recommendations to inform the city's planning for high-quality universal pre-K moving forward, which has guided Boston's continual investments in high-quality pre-K.
"I believe all children deserve a quality education whether it is in Boston Public Schools or in our community programs," said Jeri Robinson, a Boston School Committee member who also serves on the Universal Pre-K Advisory Committee. "A mixed delivery system allows us to serve more families and better prepare all children for their transition to kindergarten. As a longtime advocate for children and families, I am excited to support the Mayor's investment in early education and commitment to this community partnership."